North Korean leader Kim Jong-un has been reelected as chairman of the State Affairs Commission, the country's highest decision-making body, in the first session of the rubber-stamp Supreme People's Assembly on Thursday, according to the official [North] Korean Central News Agency Friday. In a surprise development, North Korea's perennial nominal head of state Kim Yong-nam was replaced by Kim Jong-un's right-hand man Choe Ryong-hae. Kim Yong-nam (91) took the post in 1998. 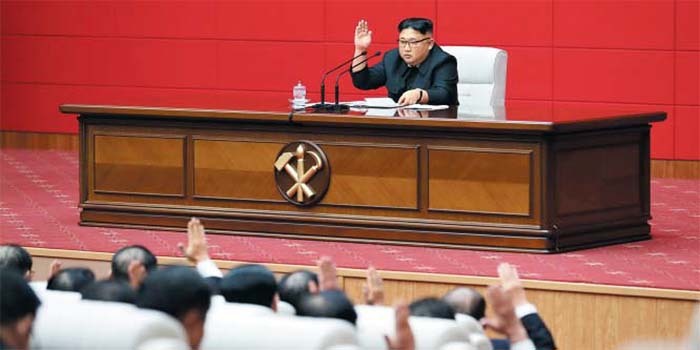 North Korean leader Kim Jong-un raises his hand in a plenary meeting of the Workers Party Central Committee on Wednesday in this grab from the [North] Korean Central News Agency on Thursday. A day earlier, Kim chaired a plenary meeting of the Workers Party Central Committee alone on the dais instead of the usual battery of stony-faced apparatchiks flanking him. The meeting, held once a year, decides key policies for the country. The moves suggest that Kim has managed to cement power at home even though his efforts to get the international community to lift sanctions against his renegade country have failed, according to a Unification Ministry official here. In line with recent propaganda, Kim used the term "self-reliance" no fewer than 25 times at the Central Committee meeting now that hard currency reserves are drying up. He also exhorted party members to "deal a telling blow to hostile forces" but did not explicitly single out the U.S. or mention nuclear weapons. The fact that Kim concentrated on economic development suggests he is in no hurry to resume dialogue with the U.S. Nam Joo-hong at Kyonggi University said, "North Korea's strategy is to ride out the sanctions through support from allies like China and Russia and wait for the U.S.' stance to change."